Asphalt paving and repair is a big expense for any municipality, but it also has a big impact. Safe surfaces in good condition protect your local residents and their property from damage and injuries. If you are ready to make the investment in your big city, small town, or even local neighborhood, there are several factors that you need to consider. A high quality surface starts with high-quality raw materials. 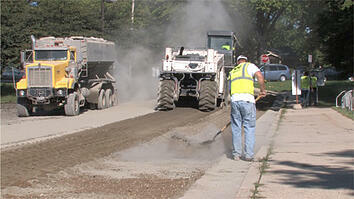 Many asphalt paving contractors buy asphalt mixes pre-made to use on paving projects. So if you are in the market for a contractor, why not go right to the source and look for a contractor that understands the manufacturing process. A contractor that makes their own custom asphalt mix clearly understands what is required for each unique job site. This means that they can control the raw ingredients, and are able to create custom asphalt mixes for each unique job. Making sure that your asphalt installation project has the correct drainage can save you a lot in future repair costs. In Wisconsin, there is precipitation year-round — and often a lot of it at once! Don’t attempt to cut costs by skimping on the features important for drainage. A road or parking lot with poor drainage will require more frequent repairs and maintenance, so proper drainage, or the use of products like porous asphalt, will generate savings in the long run. Before laying new asphalt, it is essential that the ground beneath be properly prepared to prevent instability. Compaction is an important part of this preparation process. When areas are filled in to reach the required elevation level, compaction gets the soils into thin layers. These thin layers produce a flat, highly dense soil that will remain stable under your asphalt. Pothole repair preserves safety, aesthetics, and prevents water from entering and damaging your compacted soil base. Crack filling and repair to stop small cracks from becoming big problems. Sweeping and cleaning services allow you to remove damaging debris and easily inspect surfaces. As you interview contractors for your municipality asphalt paving job, be sure to ask them about these four important parts of the process. Attention to small details can make a big impact on the long-term success your municipal project. Wolf Paving offers professional paving services from Milwaukee to Madison, and everywhere in between, including all areas around: Sun Prairie, Oconomowoc, and Waukesha. It’s never too early or too late to request a free paving estimate. Call Wolf Paving today. For the Milwaukee area, call us at 262-965-2121. For the Madison area, call us at 608-249-7931.